Today, we are in transit to Seward after surveying the Pavlof Island area for the past week. We cut our surveying down a day due to incoming weather. The RAINIER made good headway and we stayed ahead of the storm. The seas never seemed all that bad in the last 12 hours and today we have sun! I spent some time observing what the ensigns (ENS) and crew do on the bridge while underway. There are always 2-4 people on a “watch” and they continually monitor navigation instruments, weather, and look for any possible obstructions like boats out there. A “watch” lasts four hours. The RAINIER uses two different kinds of radar to track vessels or land around us. The ensigns also observe through binoculars a lot. When I was at the bridge, there were two larger fishing vessels ahead of us. 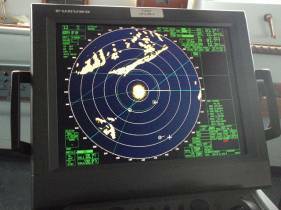 The radar tracks how far a boat is in nautical miles from us, their speed and direction headed. Many larger boats and ships carry an AIS (Automatic Identification System), which allows the exchange of ship data such as identification, position, course and speed, with nearby ships. GPS (Global Positioning System) plays an important role in their navigation also and is tied into theequipment. The ensigns and captain also plan out our routes using maps, compasses, and straight edges. Plotting our course is done the old fashioned way – paper and pencil. Below is ENS Schultz plotting our course. I spent a little time in the plotting room, where the hydrographic crew cleans up the data that has been collected during the day. I mentioned in an earlier log that the Multibeam SONAR system collects sounds waves, casually called “pings” that are bounced off the ocean floor and are sent back to the system. How well these transmissions are sent and received depends on several physical factors of the water including water depth, temperature, salinity and conductivity. I was a little stumped on how all of these factors play a roll in understanding the data and Ian, the Hydrographer Tech, reminded me about Snell’s Law, which describes how waves refract differently through different mediums. There are a couple of short QuickTime movies on the NOAA education website that show Multibeam sonar at work. Click here. 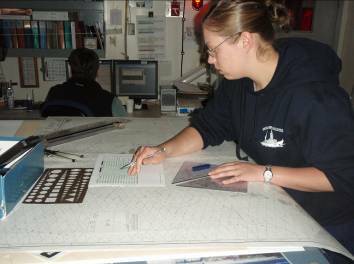 ENS Christie Schultz plots the RAINIER’s course with old fashioned pencil and paper. 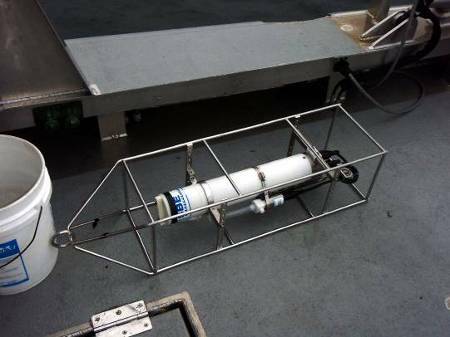 The “casts” we took every few hours with the CTD (Conductivity-Temperature-Depth) instrument help the software determine the speed of sound by applying Snell’s Law, more or less, and make corrections for the differences in the water layers. It’s interesting to note that the first layer of water may have much less salinity than deeper water due to stream flow into the ocean. In a column of water: as the temperature increases, sound speed increases; as the pressure increases, sound speed increases; and as salinity increases, sound speed increases. For more info on Snell’s Law and sound waves, go here. The sun came out for most of the day today, which enabled me to see the wonderful mountains around here. We are transiting through the Shelikof Straight just north of Kodiak and south of the Alaska Peninsula. We should be in Seward in the morning. How do sounds waves travel through water differ from light waves? What is the speed of light and speed of sound? Is the speed of sound different in salt water rather than fresh water? 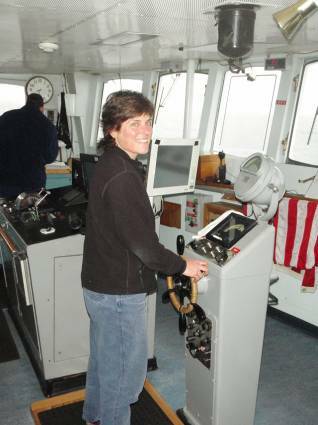 This entry was posted in 2008, NOAA Ocean Service, NOAA Teacher at Sea, Terry Welch and tagged Alaska, CTD, harbor porpoise, Hydrographic survey, multibeam sonar, noaa ship rainier, pavlov islands, seafloor mapping. Bookmark the permalink.